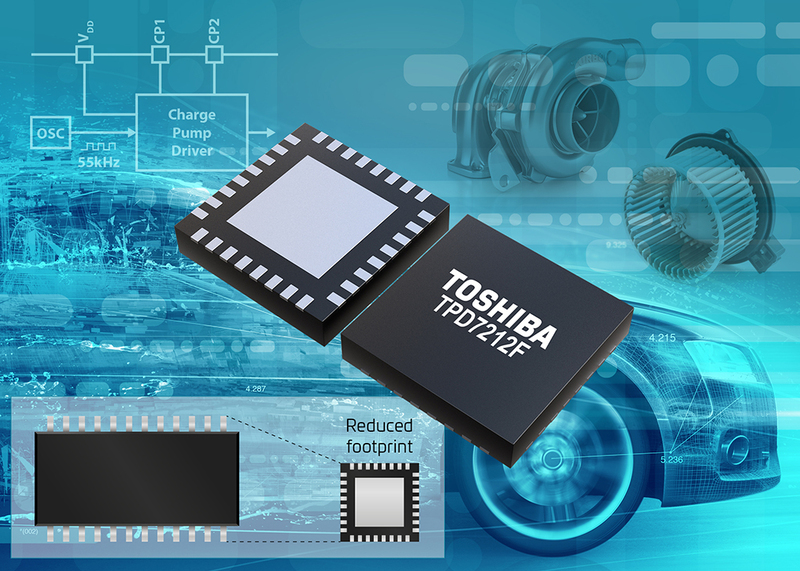 Toshiba has announced the availability of a new compact power MOSFET gate driver intelligent power device (IPD) for automotive 3-phase brushless motors. The device is intended for use in automotive motor drive applications such as 12V electronic power steering (EPS), oil/water pumps, fan motors and electric turbochargers. Toshiba’s IPD products provide protection for high-side and low-side power switches, which is especially valuable in automotive applications. Typically they protect against a shorted load, open load and an output short-circuit to the power supply as well as ECU abnormalities such as overheating. IPDs can be directly controlled from a microcontroller (MCU) and also provide diagnostic feedback to the MCU. They reduce the number of components required and improve the reliability of automotive ECU circuits. The new TPD7212F MOSFET gate driver IPD is based upon Toshiba’s 0.13μm BiCD process that allows the integration of analog circuitry with large logic and power (DMOS) devices on the same chip, thereby reducing the size and power consumption of automotive systems. Housed in a RoHS compliant WQFN32 package, with a footprint of just 5.0mm x 5.0mm, the TPD7212F offers a huge 75% reduction in area over its predecessor. It is fully qualified to the AEC-Q100 automotive standard and operates at temperatures from -40°C to +150°C. Mass production starts in August 2018.